Coffee, Tea, and Treasured Memories! Ester Fang, Alexandra Turley, and Ash Malhotra, three university students from the United States, recently completed an internship with the Generations For Peace Institute (GFPI). They helped us out with a lot of different, important tasks, from a research project on Countering Violent Extremism to providing vital assistance at the recent Samsung Advanced Training 2016 (AT16). Reason why you’re in Jordan: To study Arabic more intensively and understand what life in the Middle East is really like. I think the best way to fully understand another culture is by learning the language and then engaging in conversations with people in their native language. Coffee or tea: Tea, you can’t visit anyone in Jordan without be offered delicious, freshly-made tea. What is a treasured experience you’ll take away from your time here in Jordan? Every time I came to work at GFP, I would take a public coaster bus. The authenticity of interactions on my bus rides have revealed to me what Jordanians are really like, making my daily work commute a treasured experience. The core generosity and structure of Jordanian society is extremely evident on these buses: if a bus is full, without me even uttering a word, men would stand to offer me their seat or women would squeeze tightly so there is more room on their seat for me to sit; the bus driver never overcharges like the taxis and is attentive to the stop you request; and people of all ages ride the bus. There’s something special and rather inexplicable about taking public transit in any foreign country. 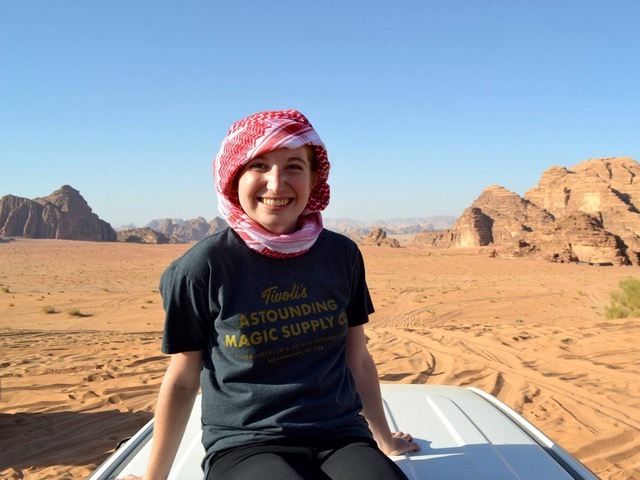 I think it comes from going from an observer of Jordanian day-to-day life, to riding public transit and having this sensation that I was living daily life with and alongside Jordanians. Beyond the amazing learning experience at GFP, it was the motivating reason behind my public bus commutes. What was out of necessity resulted in memories of a simple, beautiful aspect of Jordanian life that I’ll always look back on fondly. 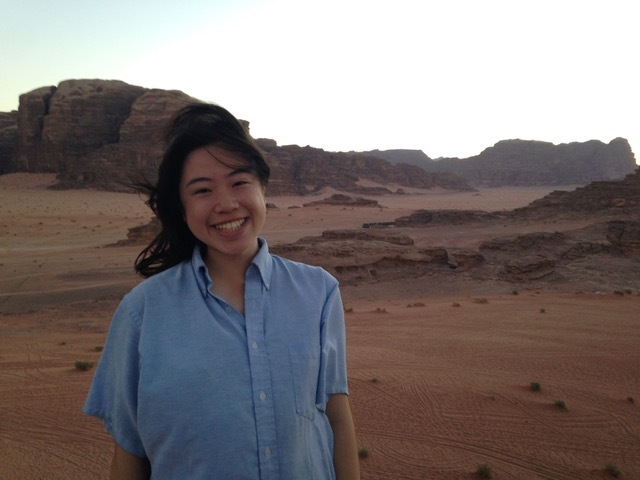 Reason why you’re in Jordan: I’m studying abroad in Jordan in order to study Arabic and international relations in the context of the Middle East. I’m particularly interested in learning about the challenges that Jordan has faced in the wake of the Syrian refugee crisis and how the international community can do more to support Jordan as a refugee host country. Coffee or tea: Tea with a lot (and I mean a lot) of sugar. What is a treasured experience you’ll take away from your time here in Jordan? During the few months I’ve spent here in Jordan, I’ve learned a lot about myself and have become a more independent person. As cliché as that may sound, it’s true. I traveled alone internationally, I was immersed in a language that I’m not fully comfortable with, and I came to Jordan knowing very few people. 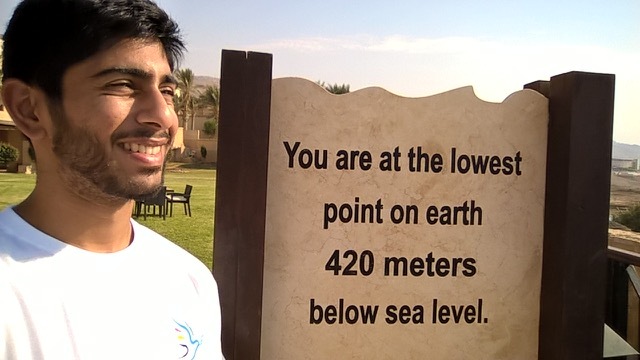 Interning for GFP also pushed me outside of my comfort zone. I had never before worked in a foreign context and had never dealt with colleagues from so many diverse backgrounds. Working on Monitoring and Evaluation in GFPI was a new and exciting challenge that helped me realise my passion for humanitarian aid and development projects. When I return to America, I’ll take back new skills and knowledge, along with pride from working at an organisation that does such amazing work on conflict resolution in communities around the world. Reason why you’re in Jordan: I wanted to study abroad in Amman to not only improve my Arabic, but to also get the chance to see what life is like in this corner of the Middle East. There’s no better way to learn about a different culture’s art, music, and traditions than by putting yourself in the center of it all. Oh and this country probably has the best hummus I’ve ever tried. Coffee or tea: Coffee! And after my time in Amman, I have to say that Turkish Coffee is going to be my new favourite. Starbucks can’t beat what you can buy for 50 qirsh on the side of the street. One of my most memorable moments was when I had the opportunity to attend the AT16 that GFP held in late October. 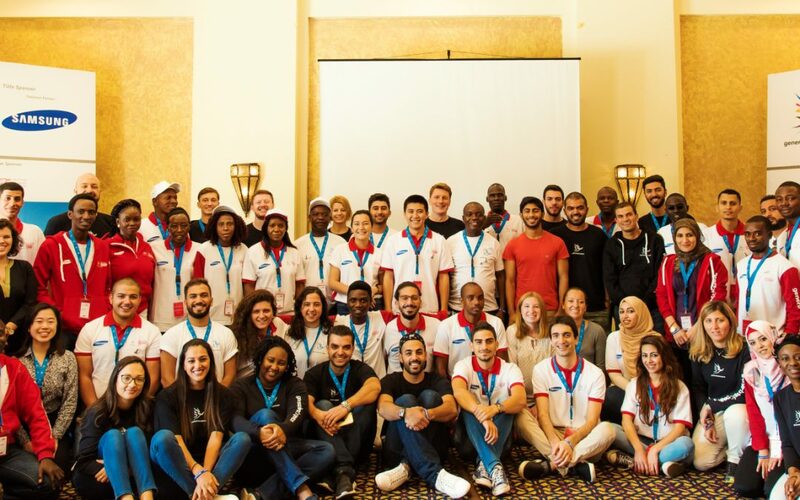 AT16 took place in a hotel by the Dead Sea, and it brought together programme volunteers from countries as close as Lebanon and as far away as Nigeria and Rwanda. I think this was the first time I actually understood the scale of GFP’s work because I was meeting the very individuals who volunteer their time daily to make GFP peace-building activities a success. At the time I had been working on “Arts For Peace” activity curriculum development, and I remember how humbled I felt knowing that I would help these very individuals in their peace-building efforts through my internship with GFP. Near the end of the training, I got to walk down to the coast and swim in the Dead Sea for the first time. I have had amazing experiences before, but nothing really compares to watching the sunset while floating right on the surface of a sea at the lowest point on Earth. Having Ester, Alexandra and Ash with us has been a real pleasure. Their hard work and commitment to GFP was much appreciated. We wish them the best of luck in their futures! Keep an eye out for future internships and job opportunities via our social media channels.